Do you have severely damaged teeth? You can rehabilitate their health and function using dental crowns in Bowie, MD. Although you know they can save your smile, you are hesitant because you do not want them causing an eyesore when you smile. What if you could get natural-looking restorations? Now you can with porcelain crowns. At Ambiance Dental Spa, we use high-quality materials to create crowns that look like real teeth. A crown is a custom-made cap placed over a tooth to provide an added layer of protection while restoring its function and appearance. They are quite versatile, allowing them to be used for several purposes. Often, a crown is used to treat a severely decayed tooth when a filling is no longer enough. They can also save a tooth that has suffered a significant break. It is not uncommon for a crown to be needed in combination with other restorative procedures as well, such as root canal therapy or a dental bridge. In some cases, they are recommended to prevent weakened teeth from breaking, such as those that have suffered strain from teeth grinding. Now, they also hold a commonplace in cosmetic dentistry because they can improve the appearance of a darkly discolored or abnormally shaped tooth. Traditional crowns are made from metal. Although they are strong and durable, they are dark, which may cause you to feel insecure about your smile. In addition, they can make your gum line darken over time and they may not be an option if you have metal sensitivities. 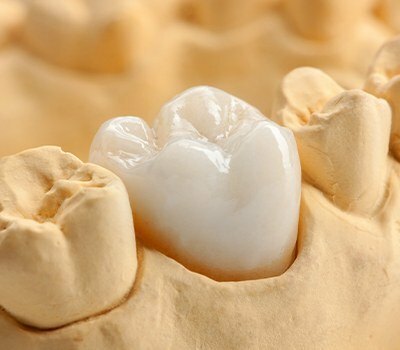 To resolve the disadvantages of metal crowns, porcelain is now the preferred material. 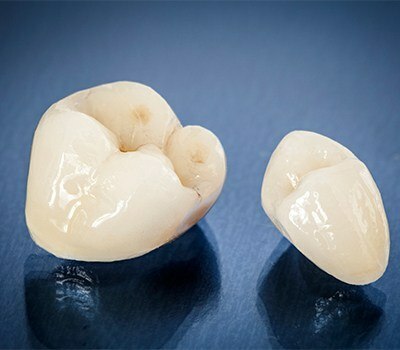 The crown is made to meet your exact needs using digital impressions. It is crafted to match the size and shape of your tooth to ensure proper functions. It can also be customized to match the color of your enamel to blend in seamlessly when you smile. Since no metal is used to make them, you will not need to worry about your gum line darkening or anyone noticing that your crown is in place. They are also hypoallergenic—perfect if you have metal sensitivities. Although they are made from porcelain, they are durable. On average, they last about 10 years before needing to be replaced. To promote their longevity, there are several things you can do. While the crown is not subject to decay, bacteria can get trapped near the edges of it if you do not practice proper oral hygiene. It is best to brush your teeth and the crown twice a day for two minutes each session. When flossing before going to bed, clean around the edges to remove bacteria and plaque. It is best to avoid chewing overly hard foods with it to prevent it from cracking or coming loose. If it becomes damaged, your dentist can easily replace it. Now, you can enjoy an option that looks natural to rehabilitate your tooth. Contact our office today to schedule your consultation for a porcelain crown.